Other highlights show refinements to the MixConsole, now with an improved dynamic hover mode and the option to show all inserts, sends and EQs simultaneously. Importing tracks from other projects is now a lot easier and now includes all track settings and content. The Key and Drum Editors come with new visualization and editing capabilities; the Chord Pads feature allows for intuitive control of arpeggiated and overlapping chords plus support of custom chord symbols. The Transport Panel has been overhauled while its menu item contains all commands and options clearly categorized in submenus. Dedicated punch points have newly been introduced, which remain independent from the locator position. Audiowarp now boasts improved audio quality when time-stretching due to the élastique v3 algorithm by zPlane, and the new MediaBay project rack expedites the location of instruments, presets and audio and MIDI files. The new Profile Manager is exclusive to Cubase Pro 8.5, allowing uses to store and recall program settings and preferences. Customized profiles can then be transferred to any studio environment running Cubase. 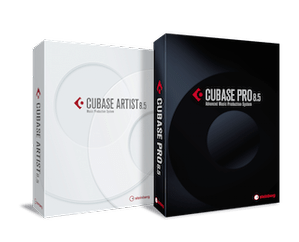 The Cubase Pro 8.5 and Cubase Artist 8.5 full retail versions are available from resellers and through the Steinberg Online Shop from December 2, 2015. The suggested retail price for Cubase Pro 8.5 is 549 euros. The suggested retail price for Cubase Artist 8.5 is 299 euros. Cubase Pro 8.5 and Cubase Artist 8.5 updates from the previous version 8 are available for 49.99 euros each. Various downloadable updates and upgrades are exclusively available through the Steinberg Online Shop. All mentioned prices include German VAT. • Suite of 53 audio and 18 MIDI VST effect processors, including Pitch Correct for vocal intonation correction and VST Amp Rack and VST Bass Amp guitar and bass tone suites, Quadrafuzz v2 and more! This entry was posted in Uncategorized and tagged cubase, cubase 8.5, cubase artist, discount, free, torrent, update. Bookmark the permalink.